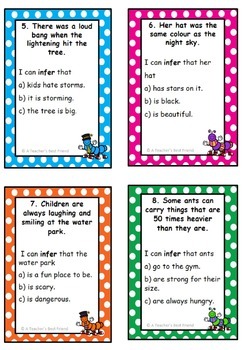 Reading strategy - Inferring / making inferences reading comprehension task cards. Great for reading groups, rotations and literacy centers. This pack includes a range of other great features which makes it ideal as an independent task and an excellent teaching tool. OVER 50 making inferences task cards + loads more! 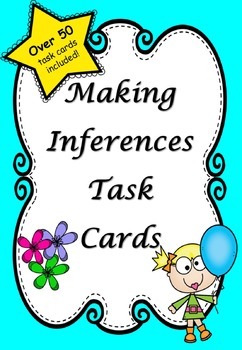 This task cards pack includes everything you need to improve students' ability to make inferences. It is a no planning required solution and perfect for use as an independent activity! 1. Over 50 multiple choice task cards. 3. 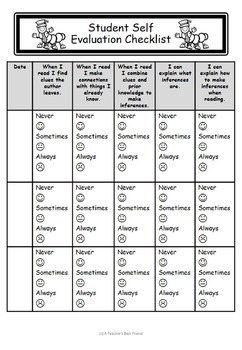 A making inferences strategy poster (B&W + Colour). 4. A making inferences graphic organiser. - include both fiction and non-fiction sentences and phrases. - are suitable for a wide range of ability levels. They slowly increase in complexity and vocabulary used. - are a great way to slowly build the skill when used over time. - can be used independently by students thanks to the additional resources included. 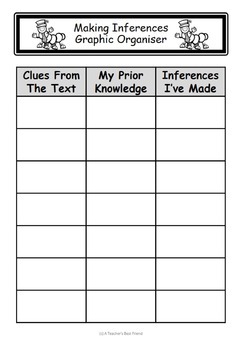 - can be used by the teacher or another adult for teaching inferencing, context clues and vocabulary. - includes the phrase ‘I can infer’ on every card to reinforce the strategy. If you liked this, you should also check out the Word of the Week for the ENTIRE year poster and activities pack. Stay updated on my products and network with other teachers.